I, for one, am constantly tempted by Sonic's Sonic Blast commercials. They are frequently advertised in the New York area, and yet the nearest Sonic is 70 miles away. And in New Jersey. So when I went for a relaxing jaunt to the Sunshine State, and my cuz let it slip that there was a Sonic by her house, I was there. After I got my IHOP rewards card of course, but more about that later. Upon driving in, I noticed the words "Happy Hour". It was the G-rated version, but it still grabbed my undivided attention. Then, I saw "Limited Time Only" and "Snickers" and the words "Hells" and "Yes" escaped from my mouth. 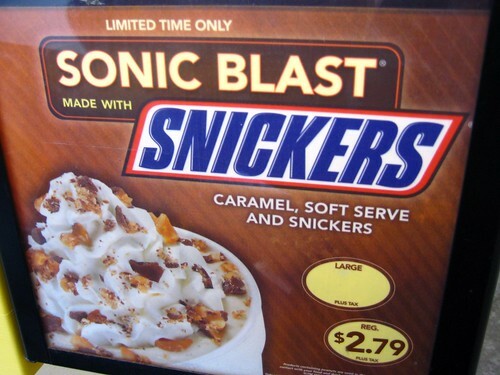 Mmm, first Sonic Blast ever. 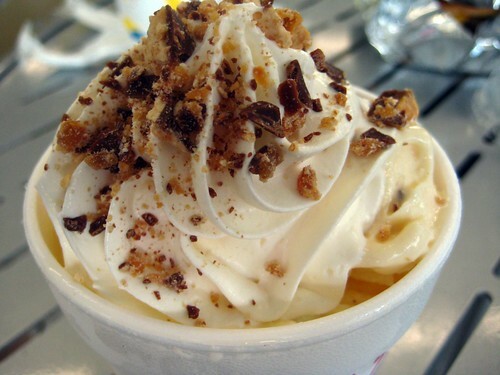 You were heaven in a large Styrofoam cup. 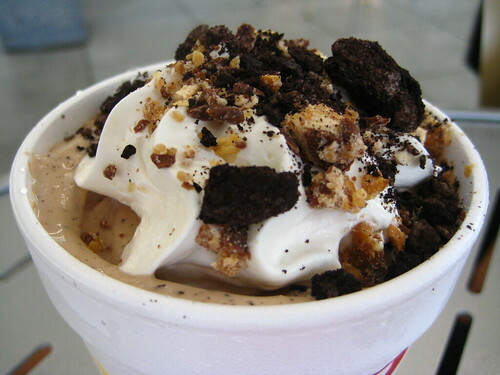 My cousin got a Blast with Oreo and I believe Snickers, but an aversion to vanilla soft serve made her convince them to (OFF THE MENU ALERT!) make it chocolate. Have them add chocolate syrup, worked like a charm. Why they don't have chocolate soft serve is ridiculous, but beggars can't be choosers. For actual food items, we went with the $1 menu-my vacation philosophy is that money's better spent on booze when in the tropics. 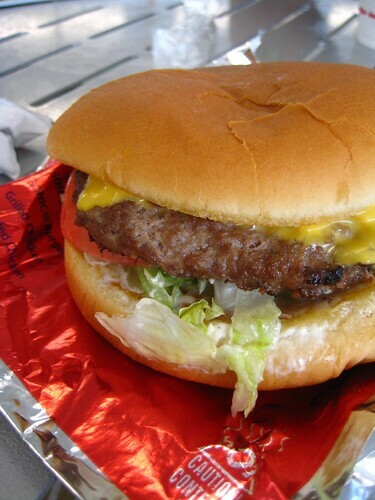 The cheeseburger was fairly good for fast food, better than some of the big chains, but no Shake Shack. It was on the saltier side, yet the fresher bun and the fact that it tasted like real meat makes this worth it. Another item was the Jr. Chili Cheese Wrap. 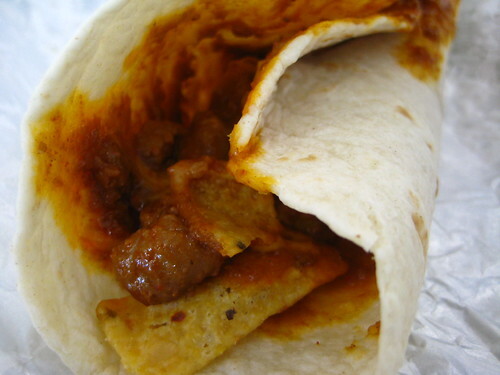 Yes, that's a flour tortilla filled with chili, cheese, and Fritos. I am always a fan of chips in sandwiches and wraps. I would love to see someone make this with homemade chili. It would be phenomenal. 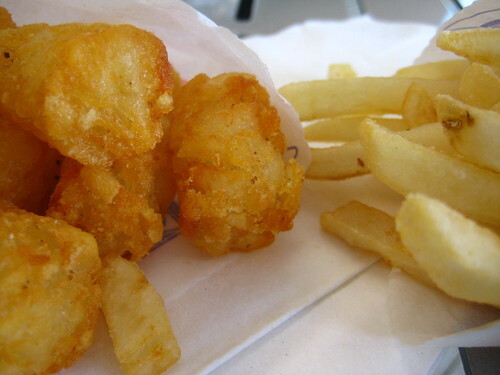 And of course, tots and fries on the side. How could I not? 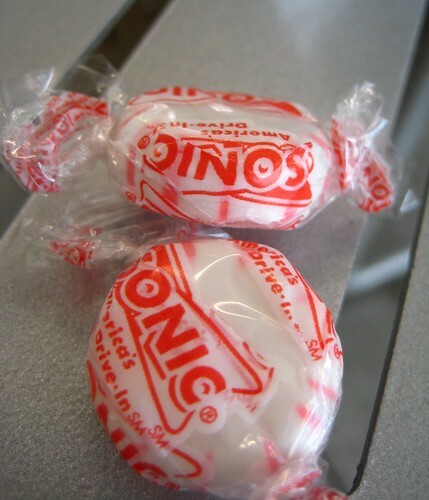 In case you're maybe on a date, Sonic provides you with mints. How thoughtful. By the way, the first New York Sonic will be far upstate, in Ulster County. Road trip! Want to find your nearest Sonic? Click here. 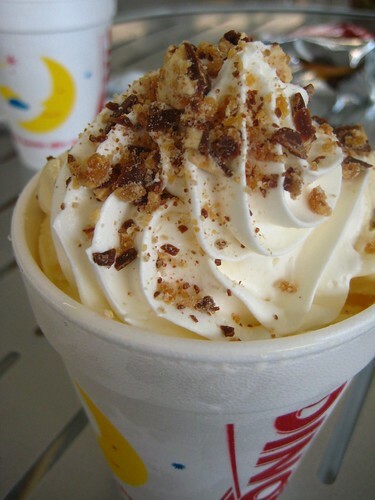 Sonic is a pretty good place if you've got one near you. I like that they've got items you're not gonna find elsewhere...like the Frito Roll-up thing you got...and tater-tots. Mmmmmmm. 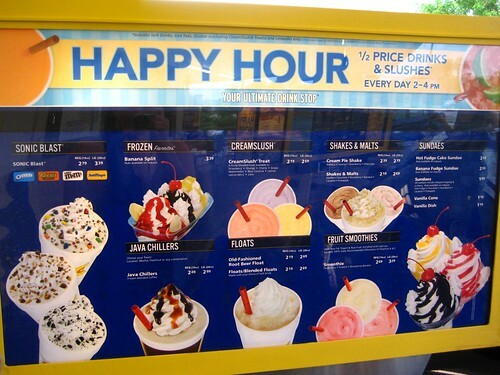 mmmm, happy hour for slushes! and tater tots! we need one of these by central park or something. I love tator tots. Thank you Sonic for being the only fast food place that sells them! Oh my goodness, I'm so jealous, I hate the fact that they always show the commercials here, it's such a big tease!